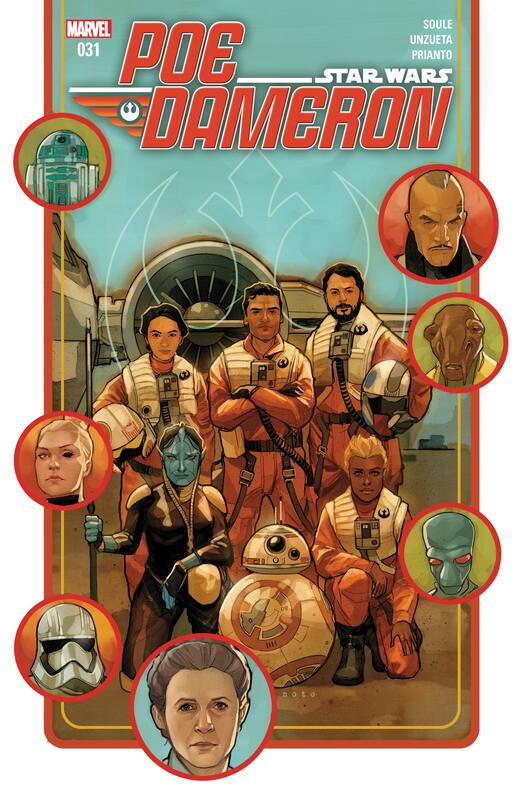 After a few long years, we’ve finally reached the conclusion of the Poe Dameron comic series. While I wish it could go on indefinitely, the slow pace of the last few issues have showed that its time to lay this series to bed before it overstays its welcome. That’s not to say that the comic didn’t go out with a bang, however. 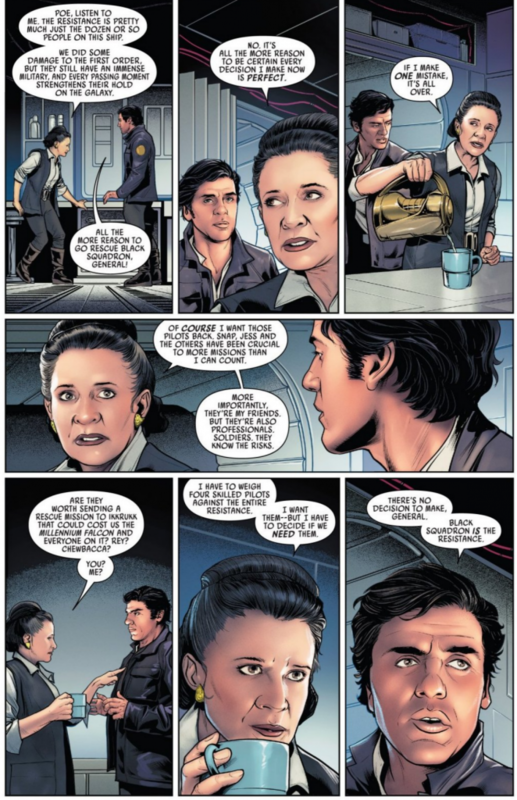 The comic begins with Poe asking General Organa to help save Black Squadron. 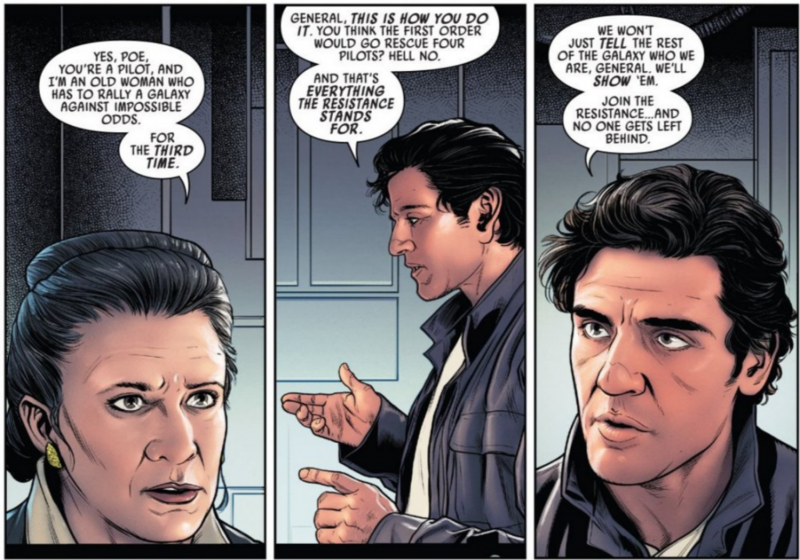 She’s reticent to help, knowing that the entire Resistance could collapse if things go wrong, but Poe shows his strength where he always does, on the individual level. He cares about the Resistance, of course he does, but he also cares about every single individual within it. I can only imagine that “Supreme Leader” Kylo Ren must have ordered the First Order to issue a report saying that their victory on Crait was a total success and the Resistance was eliminated to hide the embarrassment of his defeat, especially considering how it would put his new role into question. Additionally, it would be great to see Hux quietly going along with it, especially considering how he suspects that it was Kylo Ren, not Rey, who dispatched Snoke once and for all. 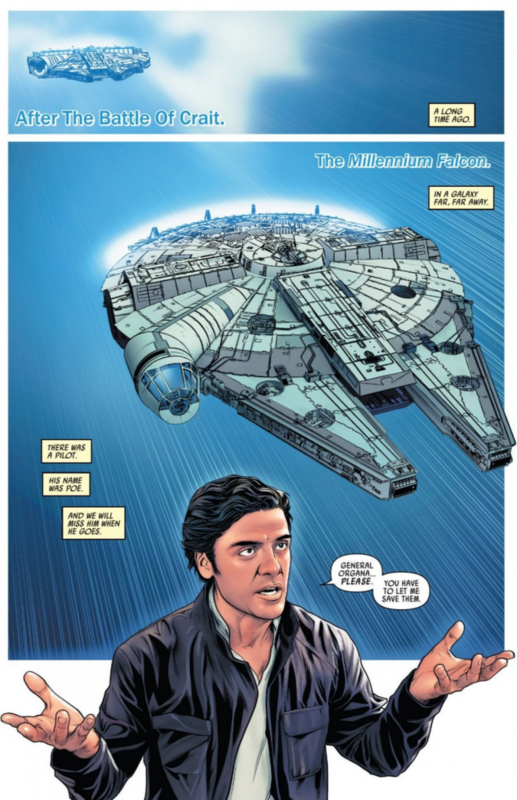 Regardless, Poe Dameron and the rest of Black Squadron save the day, and have found a new ally. 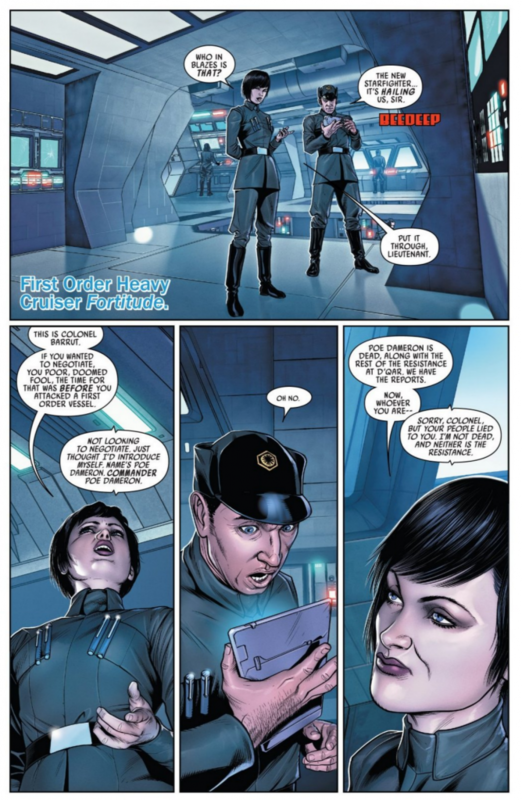 The mission is a success, and, even better, it means that we’ll probably get to see more of Black Squadron in Episode IX, plus Suralinda Javos, although considering her banter with Jess about journalism and the shot she took to the chest, she might decide to retire from Black Squadron in order to resume her career as a journalist. Either way, it was a fantastic way to wrap up the series as a whole. The pace didn’t feel too rushed, and it feels like they actually took their time to say all they wanted to say in order to set up Poe’s state of mind and the relationship between him, Leia, and Black Squadron for Episode IX. 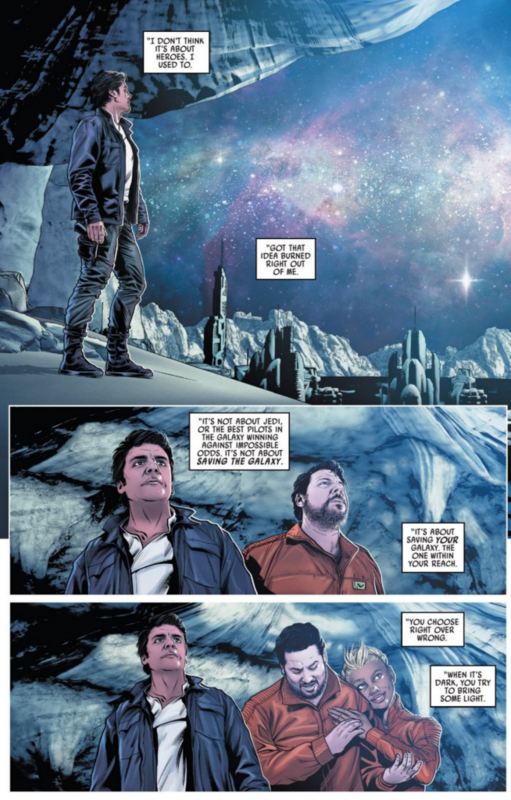 I think they did a good job rescinding his poor characterization from The Last Jedi – this is who Poe Dameron is, this is the kind of leader he is, and hopefully we’ll get to see him in more of a leadership role in the future. This issue helped to remind me exactly why I fell in love with this comic, although I do have to say that I think that my favorite part of the series as a whole was the Agent Terex arc. He was a great villain that was fun to root both for and against at the same time. He seemed more well developed than some of the other villains that we saw in this series, and was the perfect foil for Poe, matching him in both intelligence and skill. It was interesting to watch their moves and countermoves, all while slowly leading up to the logical conclusion of finding Lor San Tekka. I think it was there that the comic seemed to slow down and lose a bit of its former flow. 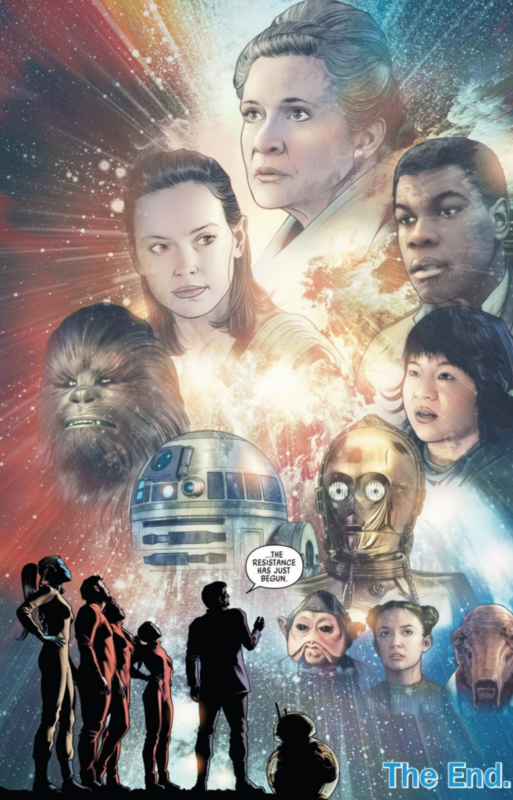 After all, it did achieve its main objective, considering the point of the comic was to lead up to the events of The Force Awakens. I felt that the two-issue recap of the film was a bit unnecessary, although it was interesting to hear the events described from a specific character’s perspective. 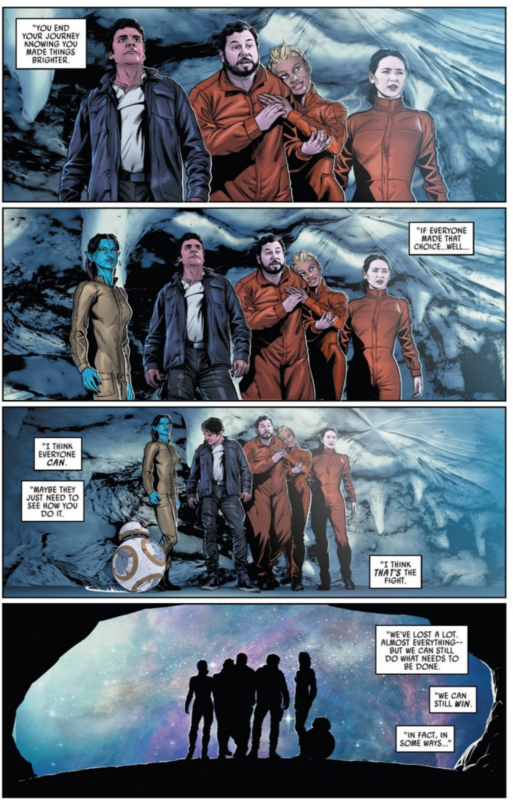 Once it got past The Last Jedi, however, the pace of the comics felt forced and stilted, trying to reveal some of what transpired after the group’s retreat from Crait, without giving away too many details that might conflict with JJ’s vision in Episode IX. All in all, I do want to go back and revisit this comic and reread it from beginning to end. There are some highlights and great moments that have definitely slipped my mind over the years, and it would be great to relive those moments. I used to set my alarm for 3 AM, when the comic dropped through comiXology on the east coast, and read each issue on my tablet with the blankets pulled up over my head. I’m going to miss that childish excitement regarding this series, but hopefully there will be another comic that has meant as much to me as this one has. I don’t think it’s about heroes. I used to. Got that idea burned right out of me. It’s not about Jedi, or the galaxy winning against impossible odds. It’s not about saving the galaxy. It’s about saving your galaxy, the one within your reach. You choose right over wrong. When it’s dark, you try to bring some light. You end your journey knowing you made things brighter. If everyone made that choice…well…I think everyone can. Maybe they just need to see how you do it. I think that’s the fight. We’ve lost a lot. Almost everything – but we can still do what needs to be done. We can still win. In fact, in some ways, the Resistance has just begun. And that’s The End, folks. At least for now. May the Force be with you!